Our school is a fun, welcoming place and by encouraging children to attend school regularly and punctually, their experience of school life is enriched. We believe that if children are to succeed both in school and in later life, good habits should be instilled at a young age. Good punctuality is part of this duty. It is unsettling for children if they arrive late as well as causing disruption to other pupils and the class teacher. The school community consists of parents, pupils, children and all staff and together we aim to form a partnership in taking responsibility for excellent attendance. We recognise that parents have a vital role to play and we are aware of the need to establish strong home-school links and communication systems, which can be used whenever there are concerns over a particular pupil. The government stipulates that children of primary school age should achieve an attendance record of more than 95%. The staff of St Gregory’s School aim to work with Parents and Children to help everyone meet this target. Attendance certificates and stickers are awarded for 100% attendance and the class with the highest attendance (with no ‘lates’) are announced the Cool Cats for the week in the Friday Celebration Assembly. Those with highest attendance come an ‘attendance audit day’ will receive an attendance treat. We are aware that there are times when absence and lateness are unavoidable and we do not want to worry your child on these occasions. It is the continual absence and lateness that we are trying to address. Those children whose attendance falls below 85% will be referred to the Attendance Officer, who will work alongside the family to ensure this figure is raised. 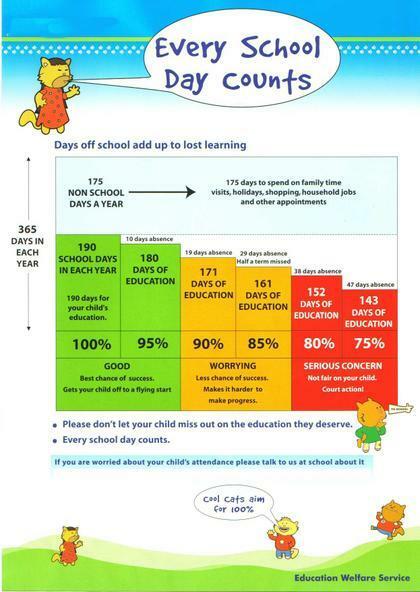 If attendance does not improve, in spite of specialist school intervention, the school reserve the right to remind parents about their obligation and then liaise with the Education Entitlement and Inclusion team at the Local Authority to issue a Penalty Notice where parents will be required to pay a fine. The school day begins at 8.50am when the bell rings. If your child arrives at school after the bell has rung, please bring them to the School Office and sign them into school. You should request the time off for your child as soon as possible and on the official form that is available from the School Office. Never ask for time off during exam or test periods. · Do not book travel for holidays in term time, until you have sought the school's permission. · Remember that the school might not agree to authorise the time off. · If the school does not authorise the holiday and you still take your child away, then the absence is recorded as an unauthorised absence and the Attendance Officer is informed. You may then be issued with a fine. The decision to issue a penalty notice (fine) or prosecute a parent is taken by the LA; in most cases after extensive work with the child and their family. Parents can be fined up to £2,500 or imprisoned for failing to ensure that their child attends school regularly and on time. Magistrates can also impose a Parenting Order, which means that the parent has to attend a parenting class. Where possible, medical appointments should be made outside of school time. Where this is not possible, please make every attempt to keep your child at school until the latest time that you can remove them to safety and punctually get them to their appointment. Get them back to school as soon as possible after the appointment. This will ensure that the least possible learning time is lost. You should not expect your child’s school to agree to an absence for a holiday in term time. Taking a holiday during term time means that children miss important school time – both educationally and for other school activities. It will be difficult for them to catch up on work later on. Parents do not have a legal right to take children out of school on holiday. The law says that schools have the discretion to grant up to ten days authorised absence in a school year. Each application is considered individually by the school, taking into account factors like the reason for the holiday, its timing and the child’s attendance record. If the school does not authorise the holiday and you still take your child away, then the absence is recorded as an unauthorised absence and the EWO is informed. You may then be issued with a fine or even be prosecuted.